(Houston, Texas - Wednesday, March 12, 2014) - Triumph and Song, winner of three stakes in the 2014 Thoroughbred racing season, was named 2014 Horse of the Meet at Sam Houston Race Park. Trainer Karl Broberg claimed Triumph and Song for $40,000 at Fair Grounds for owners H and H Ranch. The striking gray made his first appearance in the $50,000 Spirit of Texas Stakes here on January 18, never relinquishing the lead in the six furlong sprint. Just three weeks later, he made his turf debut in the $50,000 Bucharest Stakes, scoring an impressive victory in gate-to-wire fashion. On February 22, the talented Texas-bred won his third stakes of the meet, blazing to the wire of the six furlong $50,000 Sam Houston Sprint Cup Stakes in 1:09.39. Guido and Carolyn Hanek, who own H and H Ranch accepted the trophy for Horse of the Meet and spoke, with pride, of the accomplishments of Triumph and Song. "It's been such a ride," said Carolyn. "I hope everyone in our business gets a horse with this type of talent. He answered the turf question, won Texas-bred stakes and competed in open company; what else can you say? Our friends in Horseshoe Bay have supported us; it's been a party for everyone. We love having a horse like Triumph and Song." Hanek indicated that Triumph and Song will ship to Lone Star Park to defend his title in the Premiere Stakes. Jockey Junior Chacaltana has ridden the five-year-old son of leading 2013 Texas stakes sire, My Golden Song in each of his three Sam Houston stakes. "This is one of the best horses I have ever ridden," said Chacaltana. "He's fast, got a lot of heart and never quits." Total handle for the 32-day meet increased despite one fewer race day in 2014. Overall, total handle grew from $43,917,043 in 2013 to $44,493,991 in 2014. Average daily handle was up 4% to $1,390,437. Monday and Tuesday afternoon racing continued to be well-received by racing fans. The strong stakes schedule drew nationally acclaimed trainers to Sam Houston Race Park , including six-time Eclipse Award winning conditioner Todd Pletcher. The Maxxam Gold Cup Racing Festival on March 1 produced a record-setting handle of $1,960,452. Racing fans in Houston and across the country lauded Sam Houston Race Park for its industry-low 12% take-out of multi-race wagers including the Pick 3 and Pick 4. This marked the second year in a row with increases in handle of these wagers. An average of $159,655 per day was wagered in multi--race wagers, an increase of 56%. Daily purses were up 3% from 2013 to $174,000 per day, compared to $170,000 in 2013. Live attendance for Friday and Saturday was up with a daily average of 6,182, 20% over the 5,051 daily average from 2013. On March 7 and 8, Sam Houston Race Park hosted the third annual Camel and Ostrich Races. The highly entertaining weekend attracted a crowd of 23,685, topping the record-setting attendance of 18,231 in 2013. "This was a successful racing season with many notable gains," said Sam Houston Race Park president, Andrea Young. "On track, our fans responded well to our new Mobile Wagering App. Horseplayers all over the country are pleased with our low takeout and the quality of our racing product." The leading owner, trainer and jockey awards were also presented on the final day of the meeting. Steve Asmussen, won his sixth training title at the northwest Houston racetrack, finishing the meet with 29 wins. He was honored as top trainer here in 2000, 2002, 2003, 2004 and 2005. Danny Pish finished second with 22 wins, followed by Eric Reed with 17 victories and Joseph Smith, who won 15 races. "I thought the horses consistently ran well at all levels of the meet," said Asmussen of his 2014 Sam Houston runners. The two-time Eclipse Award winning conditioner gave credit to his longtime assistant, Pablo Ocampo, who has worked for him since 1993. "He is my longest continuous employee," said Asmussen of Ocampo, who ran the Houston string and will head next to Lone Star Park. Asmussen resides in Arlington, Texas and his parents Keith and Marilyn operate a breeding and training center in Laredo. "Running in Texas is important to me and my family," added Asmussen. "I am also grateful to Mr. (Will S.) Farish for continuing to breed in Texas and keeping some quality stallions in the state." The 48-year-old conditioner was one of 10 finalists recently announced on the National Museum of Racing's 2014 Hall of Fame ballot. The inductees will be notified on April 25 and the induction ceremony will be held at Saratoga Springs on August 8. "It meant a great deal to get that call," admitted Asmussen. Jockey Gerardo Mora has accomplished a great deal in the past three years at Sam Houston Race Park. In 2012, as an apprentice, he finished in second place to veteran Glen Murphy. Last year, Mora won his first Sam Houston leading rider title. Defending was no easy feat, with a very competitive jockey colony with many returning riders and the first appearance of top Mountaineer Park rider Deshawn Parker. Mora and Parker battled to the wire for leading rider honors, entering into the final two days of the meet tied with 34 wins each. 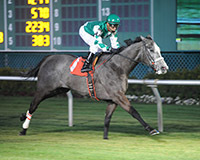 Mora was able to win his second Sam Houston Race Park riding title with 38 trips to the winner's circle, edging Parker by just one win. Lindey Wade finished third with 30 victories and Murphy and apprentice David Cabrera tied for fourth with 23 wins each. Mora won just one stakes this season, taking the $50,000 Jersey Village Stakes aboard Quiet Acceleration for Pish on February 15. "I am very happy to win my second title in Houston and have many people to thank," said Mora. "My agent (Toby Cathey) has helped me and so many trainers supported me with good horses." Born in Palestine, Texas, the 21-year-old rider has also claimed the 2012 and 2013 leading Thoroughbred rider titles at Retama Park and will head to Lone Star Park next. Texas businessman Danny Keene won his first Sam Houston Race Park leading owner title with 17 wins. He shipped in 36 starters, with the majority trained by Joseph Smith, and two by Allen Milligan. Keene's winners were a mix of maidens, allowance runners and stakes horses. Keene, who owns a plumbing contractor company in McKinney, Texas, has been involved in Thoroughbred racing for less than four years. He was honored as owner of the meet last summer at Lone Star Park, and was very pleased with his success this year in Houston. "My goal was to come here and win the title, but I had a goal of 25% wins and 60% in the money," said Keene. "I have a good crew and a great trainer. Me and my family get a kick out of racing. We love horses; doesn't matter if they are claimers or stakes horses. I have some good two-year-olds coming up." Keene prefers to have a private trainer for his horses and has entered into a very successful association with Joseph Smith, formerly and assistant to Danny Pish. "Allen Milligan used to have all my horses; he is a good man; I love him like a son, but having Joseph taking care of things has worked out well," stated Keene. Steve Asmussen was second in the owner standings with six wins and Kay Reed followed with five victories. Sam Houston Race Park will host its annual Quarter Horse meet beginning Friday, March 21. The 24-day season will continue through Saturday, May 11 with post times set for Thursday and Friday at 7 p.m. and Saturday at 6 p.m. The meet will feature 18 stakes races, commencing with the $20,000 Harris County Stakes on Saturday, March 22. Key stakes include the $100,000 Bank of America Texas Challenge Championship (G1) on April 12; the $100,000-added Sam Houston Futurity (G2) on April 19; the $50,000 Sam Houston Classic (G2) on May 3 and the $35,000-added Adequan Texas Derby Challenge on the final night of the meet, May 11. A complete listing of stakes and trial dates can be accessed on the Horsemen's page at shrp.com.